"It seems like the day has come for me to leave the Xbox. It's total nonsense that there is no backwards compatibility. Ah, but if The Idolmaster 3 comes out, I guess I'll have to buy it..."
"Television. The NFL. These things seem the biggest, but in Japan, they're totally irrelevant. For Japan, it's totally over. It's at the point where it doesn't matter if this doesn't sell in Japan." "I gathered that they didn't think about Japan at all." "I'm looking forward to the new Kinect." "The PS4 [reveal] had more of a technical rundown, so it was more interesting." "Western internet forums are on fire. lol"
"It was like, you can play those [old games] on the 360." "Well, the controller didn't get worse. But, whatever..."
"Even if the functionality is increased, what you end up with is an old PC. It's okay they are putting effort into TV and video services. I don't need that, though, because I'm enjoying my PC gamer life." "Put together a presentation for gamers." "I wonder how Americans are gaming at home. Whenever I'm playing a game, I never feel like I want to watch TV, so the ability to switch between the two makes no sense to me." "They [Microsoft] are not looking at Sony or Nintendo, but are frantically coming up with countermeasures for Apple and Google." "And here, I thought they were going put out something with amazingly high specs..."
"The only thing I thought was amazing was the multi-tasking." "Kinect is certainly amazing... But, what's this feeling I have that I cannot really explain... Have I turned into some elderly, decrepit gamer?" "They're totally not thinking of Japan...This is worse than the Xbox 360." "That D-pad on the controller was good. I guess they won't put that out on the slim Xbox 360." "I like the console's design. But I have no clue why it's so damn big." "The reaction from foreigners isn't good. On Twitter, it's being trashed." 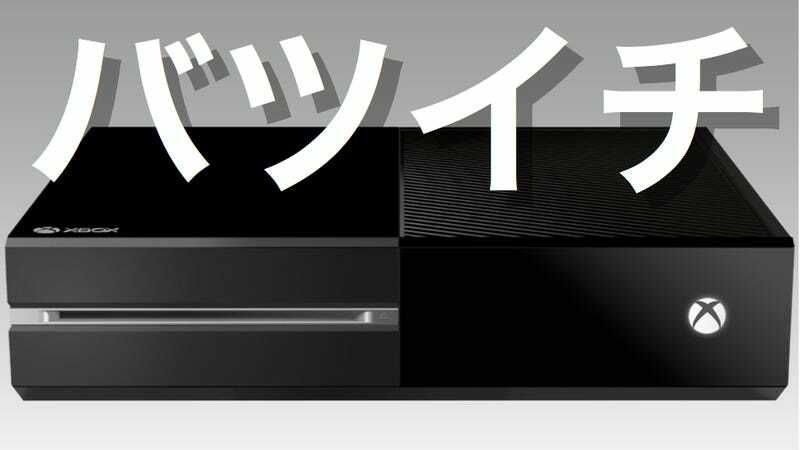 On Twitter in Japan, the newly announced Xbox One has a couple of new nicknames. However, there is a bit of a good natured dispute over what the Xbox One's nickname will be: "Batsuichi" (Once Divorced) or "Hako 1" (Box 1). The name "Xbox" has always been somewhat problematic for Japan, because "X" is "batsu" (ばつ) in Japanese and is used to mark incorrect answers. In the West, "X" can cross things out. But it can also mean "X marks the spot" or carry the nuance of "extreme". In Japan, however, the circle is used to denote correct items. (This is why on Japanese PlayStation controllers, the circle button is used to select.) Thus, the "X" can have a negative meaning—though, not always. For example, Toyota has a sedan in Japan called "Mark X". Old Japanese men seem to like it fine! As mentioned above, one of the nicknames for the "Xbox One"—a nickname that seems to have started on Twitter—is the Japanese word for "divorced". The shortened "X1" can be read as "batsuichi" (バツイチ), which is literally "one x" and means "once divorced". The other nickname is a continuation of the somewhat disparaging nickname for the Xbox 360, which is "Hako 0" (箱０ or Hako Maru). "Hako" (箱) means "box", and "maru" means "circle". In Japanese, calling the console "hako" isn't rude per se. It just doesn't sound very cool! So, now Xbox One is also being called "Hako 1" (箱1 is "Hako One" or "Hako Ichi", with, of course, "ichi" being "one" in Japanese.) In an odd way, calling it "Hako 1" makes sense, especially after the "Hako 0" moniker. It makes more sense than going from "Xbox 360" to "Xbox One". From what people are saying online in Japan, it sounds like the Xbox One isn't exactly hitting the ground running. There's long been this notion in the West that Japanese people don't buy foreign goods. That's not true. They tend buy the goods that they think are the best, whether they are foreign or Japanese. The Xbox 360 is a fine console, but it never really caught on in Japan. Perhaps, it was the line-up or games or perhaps it was the sinking feeling Japanese gamers had that Microsoft didn't really care about the Japanese market. It doesn't really matter now. Microsoft has had a successful run with the Xbox 360 all over the world. But just think how much better the console would have done globally if Japan became enthralled with it.